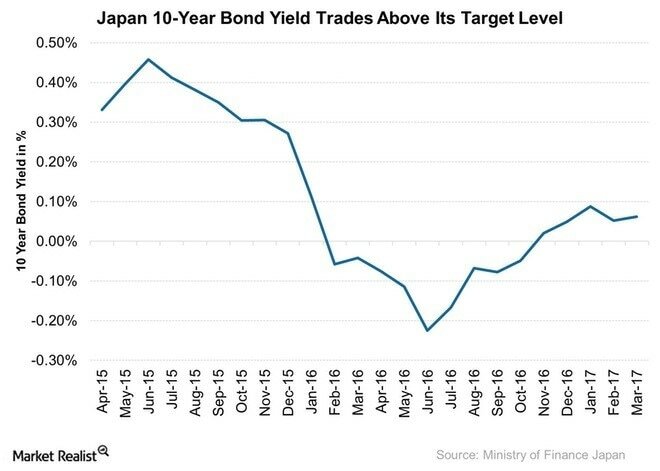 The graphic below shows how interest rates on Japanese government bond have been changing in the last two years. ​Thorough time these monetary policies have led to an extreme condition clearly understandable by referring to the IS-LM model. The increase of money supply has pushed down the LM curve so much that any other increase on money supply would have no effect on the interest rates: of course, a liquidity trap. 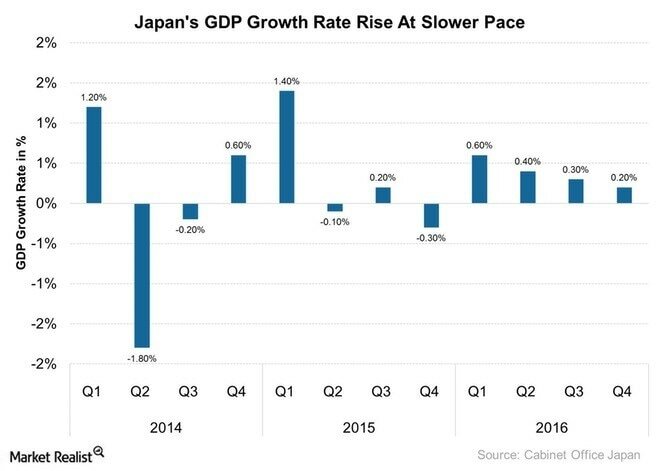 Despite that, Japan’s economy did not react as predicted and hoped by Shinzo Abe: investments still do not increase and inflation target of 2 % still seems to be difficultly achievable. 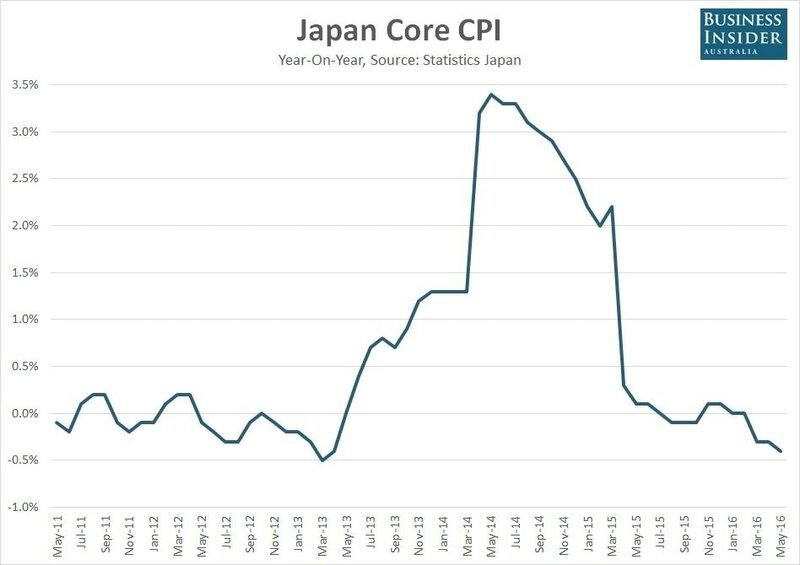 The first graphic below clearly shows the variations of Japan inflation rates (Core CPI) over time while the second compares the GDP growth (annual %) of Japan in the last three years: Japan GDP is very little influenced by BoJ’ monetary policies. ​So, what are some of the reasons behind the insensitivity of Japanese economy to monetary policies? According to Haruhiko Kuroda, monetary policies are ineffective because of a consolidated mental belief of deflation in Japanese mentality. The habit of seeing a decrease in prices and wages over time has made Japanese disbelief of a possible future inflation and so they still avoid buying today hoping that “tomorrow it will be cheaper”. A potential solution would consist in structural reforms aimed at strengthening and making more competitive Japanese exporters. However, the price to pay to achieve that goal would be a further reduction of salaries and worse working condition while, in reality, the main reasons of weak Japanese exports are foreign factors, such as the contraction in demand of the main export recipient (China). Finally, a substantial percentage of the population simply does not spend because of low wages and beliefs that the situation will worsen in the future. According to a survey emitted by the BoJ, only 5% of the respondents have declared their intention to spend more next year, the remaining 95% will continue to reduce its expenses. Of course this article exemplifies things a lot and can’t be taken as the final word but it provides valid reasons of how the most important monetary experiment has failed and probably why a lot of new debates about the actual effectiveness of quantitative and qualitative easing have started. Alternative solutions to the current expansionary monetary policies are being explored but this would probably be a good topic for another article.